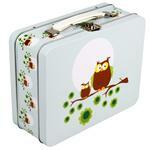 The Lunchbox World Blog: Inspiration for your lunch box: In the Press: Lunchbox World on Red Online! In the Press: Lunchbox World on Red Online! Wow! You can imagine my excitement to be sent the link in an email first thing in the morning to Red Online, the online arm of Red Magazine in the UK! I don't know about you, but I rather like reading Red Magazine, with its varied articles and easy-to-read soundbites of information, along with their inspirational stories of entrepreneurs and aspiring women. Not only was this particular soundbite featuring Blafre, some of the cutest retro lunch boxes to be found in Europe, but as I scrolled down the clipping, I found to my delight that Lunchbox World was featured as THE stockist! Now to be fair, we do stock a really wide range of Blafre. We've the bottles, the lunch boxes, the sandwich boxes, the small tin boxes and also the lovely thermos flasks, so you really have got the choice! You can also buy it all to match! However I couldn't just leave the post at that, I just had to add a snippet of it for you to read here... So thanks again Red Magazine Online! We’re loving these fabulous new lunchboxes designed by BLAFRE in Oslo, Norway. Beautifully made with a white plastic and metal handle which is prefect for little hands to clutch onto. The bright colours and easy-to-clean interiors make them a winner for kids and mums alike, and we think they’d be perfect for all those up-and-coming picnics (come on summer). Girls will love them for storing their hidden gems and bits and pieces too. The Norwegian company is family-run by husband and wife team Ingrid and Remi, and their inspirations comes from daughter Nora. Too, too sweet. And they must be on a winner as in 2011 Ingrid was named Female Entrepreneur of the Year in Norway. What other exciting news will we discover as we hop into Spring?! Which is your favourite lunch box from Blafre? Or what do you love about Spring?